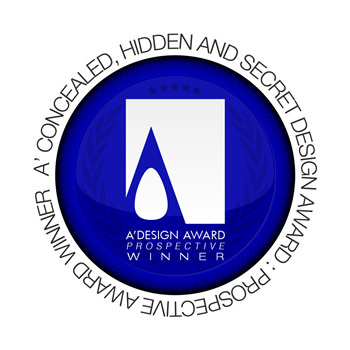 The category 999, “Concealed, Hidden and Secret Design Award” is intended for applications of products, services and designs which are desired to be kept secret for a limited period of time, this category is suitable for products that are not yet patented or where the secrecy of the products is important for an extended period of time. For reasons of additional secrecy, the jury panel for this category is also different and jury members voting this category agrees not to disclose any product information to public (except name and function of the product and award winning status). Furthermore awarded entries in this category are also not published up to three years to keep the project confidential. Learn about concealed categories. Remaining rules and regulations and evaluation criteria for this category is taken from the relevant non-concealed category. For example, a packaging design will be judged based on packaging design regulations if submitted to this category. After awarding a product or service in this category, category change to regular categories is possible after request and payment of the category change fee. An administrative fee is required during post-competition category change to ensure that no early disclosure is made without consent. A1. Even though the category is concealed, the entries could be visible after 3 years, the decision is left to A’ Design Awards. Participants reserve right to have their entries made visible earlier through category change service. Alternatively, participants could request for disqualification within 3 years so that their products could not be visible anymore. A2. Award winners in this category will not receive services that would make the designs and their details publicly visible. The following are given as example services that award winners will be excluded: Yearbook participation, exhibition participation, pr-campaign, press releases, pr-distribution etc. However the following could potentially be visible to public: “Project name, category name, primary function, designer name, and small thumbnail image”. A6. You cannot submit state or government secrets, or any other top-secret trade secret that could potentially create heat for A’ Design Award & Competition. If you submit such secrets, A’ Design Award and Competition keeps the rights to release their details to prevent harm to itself and their agents. A7. Even though your entry is labeled secret and hidden, in cases where publishing your design details is required such as by law, or due to other external threads, we reserve the right to publish the designs in any case. When submitting to the this category, please refer to the original design award criteria, for example for some categories, keep in mind that your submission will be evaluated on multiple dimensions, your product is judged together with its packaging, and if applicable maintenance/usage/application guide. Applicants should send high-resolution images of the product, together with a presentation of its packaging and application guides. For detailed and correct presentation guidelines please refer to best-fit category. The award considers your submission on evaluation criteria such as: Innovation, uniqueness of the project, social impacts, environment friendliness, energy utilization, and project specific criteria. Most important criteria are highlighted as: Design, Engineering, Ergonomy and Presentation. To learn the correct criteria for your specific design project, check the relevant non-concealed category that applies for your submission. Unlike some other design awards and competitions, you are not obliged to make any further fees for winning the award and everything listed in the winners benefits will be provided free of charge. However please note that, as also clearly written, some of the pr and marketing services are not going to be available due to nature of this category. To apply your product, packaging, design or service for the concealed design award category, simply upload your design regularly and choose the Concealed, Hidden and Secret Design Award Category from the category list during nomination. Please especially remember and note that, entries will be concealed up to 3 years only. After 3 years, entries will become publicly visible and they will also be visible online. This condition is especially put forward to push any latent development, and to ensure that the awarded companies and awarded products would be verifiable in future. Award winners will be able to use a title that matches their nomination category: Such as "Prospective Design Award Winner". Previous winners of the Concealed Design Award category is not available for public and winners are listed as "Prospective Winners" until the results are public within 3 years. Press members could request contacts of the awarded entity to learn more regarding the products and services awarded. For the submission requirements of this category, please instead refer to the relevant non-concealed category that your submission would apply. For a list of categories, click here.